Program for Leading Graduate Schools supported by MEXT (Japanese Ministry of Education, Culture, Sports, Science and Technology) and Ochanomizu University’s Divisions of Life and Advanced Sciences offer graduate students at Ochanomizu University the opportunity to acquire the key scientific and technological competencies and complement it with leadership skills that will enable them to understand and work more effectively with different background professionals. If you are a female undergraduate in a related field and if you are interested in getting your graduate degree in Japan, becoming part of a global scientific network, take a look at our Minor course structure and our scholarship* scheme and lead your future. 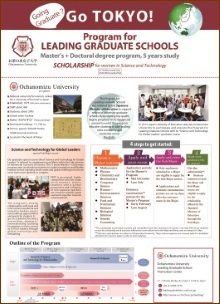 Note*: This scholarship is provided yearly and on competitive basis by “Ochanomizu University Program for Leading Graduate Schools” which established the Minor course, and only students enrolled in both the Major and the Minor course are eligible to apply for it. The Major course aims to equip students to work as professional scientists by building on an existing appropriate Bachelor’s degree. The Minor course aims at complementing the studies in the Major with Sci-Tech global leadership knowledge and skills. The Major and Minor courses may be completed in parallel within 5 years (2 years Master + 3 years Doctoral studies) and leads to a Doctor of Philosophy award (in the scientific field you have chosen as your Major) with a Sub-Major in Science and Technology for Global Leaders. * Only students admitted in a Major course offered by Ochanomizu University’s Life or Advanced Sciences Divisions are eligible to apply to the Minor course. Please visit the following websites for more details. Only applicants admitted to a Major are eligible to apply for the Minor course. Applications and entrance examinations periods are set up soon after the entrance examination in the Major. Special entrance examination for non-Japanese applicants may be organized. Please visit the following page in this website for more details. Get financial support: The payment of a tuition fee is required only for the Major course. The Minor course is free of charge but compulsory. Students admitted in the Minor course are eligible to apply for the scholarship which is awarded yearly and on competitive basis by the Minor course program. Get the scholarship and start your graduate student life in Japan!